Well, if their trend continues, the Lions will reach four wins this season after going an infamous 0-16 in 2008 and then “improving” to 2-14 last year. 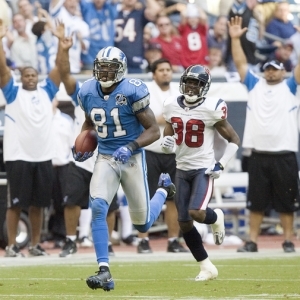 Unfortunately the Lions weren’t able to break their road-losing streak, which is now at 20 games in a row (2001-’03 Lions own record of 24 in a row). And Detroit actually lost at home to St. Louis last year for the Rams’ lone win of the 2009 season and their first road win since midway through the 2008 season. Still, it’s pretty obvious that things are looking up in Detroit. The offense showed a pulse at times last year and it seems the Lions do have their QB of the future in Matthew Stafford, who threw for 2,267 yards and 13 TDs, but also a way-too-many 20 picks despite missing six games due to injury. Calvin Johnson remains one of the top wideouts in the league despite spotty quarterbacking, and adding Nate Burleson should take some pressure off Johnson. And the Lions appear to have two good receiving tight ends in second-year player Brandon Pettigrew and Tony Scheffler, who was acquired this offseason from Denver. And look for rookie running back Jahvid Best out of Cal to have a very nice rookie season – read my story on the NFL Offensive Rookie of the Year player props. Best can score any time he touches the ball, while the Lions had only five rushes for 20 yards or more last season, and two of those were by quarterbacks. Best, who runs a 4.35 40, will start over a rehabbing Kevin Smith. The defense has been the main problem for this team, as it has been the lowest-ranked unit in the NFL for three consecutive seasons. The Lions added several veterans on that side of the ball to help, notably CB Dre' Bly, DT Corey Williams and DE Kyle Vanden Bosch. But by far the biggest addition will be No. 2 overall pick Ndamukong Suh out of Nebraska, whom many scouts have called the best defensive tackle prospect to enter the league in two decades. Thus, the front four should be much better, and there are solid building blocks at linebacker (DeAndre Levy) and safety (Louis Delmas). The defense still won’t be good, but it could at least finish better than 25th or so. This schedule is ranked as the 12th-toughest in the NFL next season with an opponents’ 2009 winning percentage of .508 (130-126). There are eight games against playoff teams from last year, but that’s a bit inflated by the fact two NFC North teams reached the postseason last year (Vikings and Packers). Not only are there no prime time games on here, there aren’t even any 4 p.m. starts, which is odd. By the way, Detroit hasn’t appeared on “Monday Night Football” since 2001. Thank you Matt Millen! That lousy Lion defense was pummeled twice last year by Week 1 opponent Chicago, with the Bears totaling 85 points in sweeping Detroit for the second year in a row. There are probably only two realistic road wins on here for Detroit to end that losing streak: at Buffalo and at Tampa Bay. If the Lions don’t win at Buffalo, they could break their own NFL record for consecutive road losses. That’s also likely Detroit’s lone cold-weather game. Detroit won’t be winning at Green Bay – it has lost 19 straight at the Packers. Starting with three of four on the road probably means another rough start – 0-4 looks pretty likely. In fact, if the Lions have two wins by the bye it’s an upset. Detroit probably will only be favored once this season: that rematch of last season’s loss at Ford Field to St. Louis. The Lions’ longest road trip of the year – to Dallas – precedes that short week game against the Patriots. And Detroit hasn’t won on Turkey Day since 2003 and no game has really been close since then. But at least that starts a three-game homestand. My NFL predictions say the Lions could reach five wins, but I think they double their total for the second year in a row and finish 4-12 – so take the ‘under’. Be sure to bet my NFL picks at BetUS.